ASSA ABLOY Security Solutions, has launched its new CLIQ® Connect app, a simple and cost-effective way for facility managers to control the security permissions of a mobile workforce from their smartphone. Facility managers can update, amend, revoke or renew access rights remotely from the CLIQ® Web Manager software and the latest Bluetooth® technology paired with a mobile phone. Mobile workers then simply need to open the CLIQ® Connect App for the updated access permissions to be instantly transferred to their programmable CLIQ® key via Bluetooth®. This technology provides flexible access control and a secure key management solution for facility managers. Access rights can be tailored to meet individual requirements, so permissions are only granted for the specific time and date needed. Furthermore, a lost key is no longer a threat, as facility managers can simply remove the key’s access rights from the CLIQ® Web Manager software, at anytime and from anywhere. 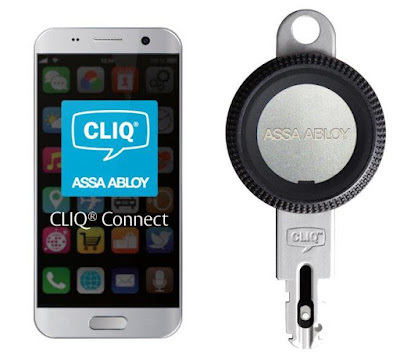 CLIQ® Connect is currently available on the eCLIQ platform from ASSA ABLOY Security Solutions, which features a pioneering and 128-bit AES encryption. Developed to offer high security and resistance to electronic attacks, eCLIQ’s proven technology and advanced microelectronics ensure quick and secure communication between lock and key. CLIQ® Connect will be rolled out to the organisation’s acclaimed ASSA CLIQ® Remote system later this year. With no extra hardware required, to get started all mobile workers need is a smartphone and to download the CLIQ® Connect App. “Facility managers and their mobile workforce are short on time, and want solutions that are easy to implement and help simplify workflows. CLIQ® Connect has been designed to meet these needs. It has never been so easy for access rights to be issued to remote workers, nor update these so quickly. For more information on CLIQ® Connect, please visit www.assaabloy.co.uk/cliqconnect, or contact Simon Wilson over LinkedIn, Twitter, or via email at simon.wilson@assaabloy.com.